Boracay Island is known as the No. 1 Spot for Kite Surfing in Asia and even ranks within the Top 10 spots world wide. 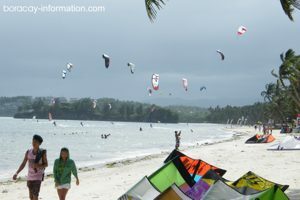 It's the Bulabog Beach on Boracay's east coast which makes Boracay so perfect for Kite Surfing. A constant moderate to strong wind is blowing in during the high season from November till May from the east and makes a real pleasure for Kite and Wind surfers alike to enjoy their sport. Some years ago Bulabog Beach was still empty and scuba divers dominated the island until some people found out how perfect the lonely beach was suited for Kite Surfing. It has a very big shallow lagoon with a coral reef outside, which protects the lagoon and the beach against the big waves that break outside the lagoon. Kite Surfing on Boracay at the Bulabog Beach. Bulabog Beach is easy to reach, since it is located just opposite the famous White Beach, at the other side of the island. If you pick up the D' Mall as a startup point, you just have to cross the main road and walk about 500 down to the beach. Tricycles will bring you there from all other places of White Beach for about 100 Peso (Special Trip). Along the Beach (at Bulabog Beach) one finds several Kite Surfing Centers which offer lessons as well as rental of equipment. A three days Kite Surfing Course with one or two students per instructor costs about 15.000 Peso. There are also professional IKO Instructors on site. Bulabog Beach is also a place on Boracay where you may find some reasonable cheap accommodation, but the big resorts have already discovered the potential of this area and as time goes by, more and more high class hotels and resorts pop up at Bulabog Beach and will replace the traditional bungalows one by one.